原价卖299.95 美元的3 个许可的软件包，现在给5 个. 保持原价. 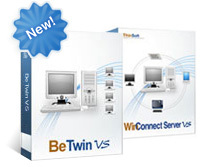 BeTwin VS 用于 Windows Vista 和Windows 7；WinConnect Server VS 用于 Windows Vista, Windows 7, Windows Server 2008, Windows Server 2008 R2 / R2 Foundation 和 Windows Small Business Server 2008 / 2011, ThinSoft 最新发布的产品. 在此下载、试用 ThinSoft 发布的各样软件. 如果你有任何的销售咨询需要，请联系我们 . 将 1 台电脑变成 9 台! Buddy B-680 Premium/Lite 软硬件包可让 2-5 个用户共享一台电脑的运算能力和资源. WinConnect 客户端软件解决方案允许安装 Linux 系统的电脑和瘦客户端设备连接到 Windows® 终端服务器，以通过网络或互联网运行 Windows® 应用程序. ThinSoft（控股）有限公司是全球领先的瘦客户端解决方案（TCS）开发商和经销商，这种方案能够降低 IT 运营的总体拥有成本（TCO）. Thinsoft 提供创新远程连接软件，例如，WinConnect支持多个远程桌面同时连接. Copyright © 2009 ThinSoft Pte Ltd. All Rights Reserved.